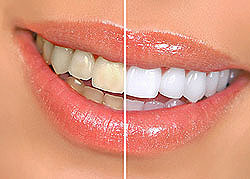 Teeth whitening is a cosmetic procedure available at our dental clinic in London. It’s the quickest and most effective way to improve the appearance of your smile. The natural whiteness and brightness of teeth fades over time, with them discolouring and staining due to a range of things that we commonly consume, like coffee, tea, red wine and cigarettes. The purpose of teeth whitening is to restore your teeth to their natural, white colour, to once again give you a glossy, healthy smile that you’re proud of. Professional teeth whitening treatment can achieve in an hour what’s impossible with cleaning with toothpaste and mouthwash alone, no matter how hard or long you try. With advancements in technology, teeth whitening has never been quicker or more comfortable. At our dental clinic on the Kings Road in Chelsea, we use the latest, most sophisticated, teeth whitening equipment, which means we can guarantee both safety and great, long lasting results. You can make your existing colour up to eight shades lighter. We’ll show you the different shades and discuss with you exactly how white you want to go. You can choose between in-clinic teeth whitening, home teeth whitening, or a combination of both. Our in-clinic procedure – delivered by our highly trained, fully qualified, GDC (General Dental Council) registered dentists – is pain-free, takes just one hour and provides immediate results. For the in-clinic treatment, the dentist will first apply a whitening gel to your teeth. This specalist gel works with the laser whitener to gently penetrate the surface layer of your teeth, removing stains and discolouration as it does so. Once the gel has been applied – and with a gum shield in place, leaving only your teeth exposed – the dentist will direct the whitening laser light inside your mouth. This is generally done in three fifteen to twenty minute sessions, with cleaning, checking and gel re-application, if necessary, between each of them. Our at home kits allow you to whiten your teeth from the comfort of your home in a timeframe that suits you. For optimal results, we recommend using it once per night for at least two weeks. The home whitening kit is simple and easy to use, and we’ll give you a full talk through of exactly what steps you need to take. In short, it involves the dentist taking an impression of your teeth to create a custom mouthguard, which you then apply a whitening gel to and wear overnight while sleeping. These kits are superior to the off-the-shelves ones available in shops, with better, long lasting results. Whether whitening your teeth in-clinic or at home, no tooth enamel is removed or damaged during the process, and as the procedure is painless, no injections are required. The results of teeth whitening typically last around three years, but even at that point your teeth will still be considerably whiter than they were before the treatment. To find out more about teeth whitening, or to book an appointment at our dental clinic in London, call 020 7148 7148, email info@thewellingtonclinic.com or send us a message using the below contact form.